Heart disease is the #1 cause of death for humans both in the U.S. and globally. Practitioners in both human medicine and veterinary medicine are working diligently to raise public awareness of cardiovascular disease. Regular checkups for both humans and pets could easily spot the early warning signs of heart disease in humans, dogs and cats. Prevention and lifestyles are key. Risk factors must remain low and can include ownership of pets. Pets provide a positive effect on stress levels, blood pressure and emotional well-being. Dog ownership lowers the risk of cardiovascular disease and mortality according to an article published in Scientific Reports in November 2017. Humans - Aim for 150 minutes of physical activity per week (that’s only 21 minutes per day!) You don’t have to do it alone- group classes and buddy activities can make work out time a lot more fun. Dogs - Dogs love being active too so bring them along on your walk! It passes the time and is a great way to bond with your pet and help keep them active too. Cats - Feline friends need to be active as well, so finding interactive toys to play with your cat helps them stay fit! Healthy Eating, Helps Maintain Optimal Weight . Humans - Small eating habit changes can make a big difference! Look for ways to lower sodium and trans fat, and add more fruits and vegetables daily. Cats - Help your feline avoid fat cat syndrome - overweight patients with and without heart disease that successfully lose weight have an easier time breathing and are more comfortable. Dogs - Second hand smoke affects pets, too. Pets who breathe secondhand smoke are more likely to get pneumonia, bronchitis, and poor lung function. Cats - Feline asthma is a big problem in cats and patient symptoms can definitely be worsened by second hand smoke. 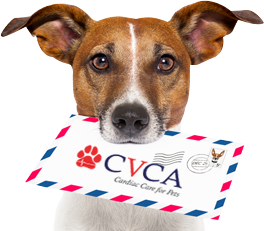 To learn more about CVCA Cardiac Care for Pets, visit www.cvcavets.com. And for humans, visit the American Heart Association at http://www.heart.org/HEARTORG/.